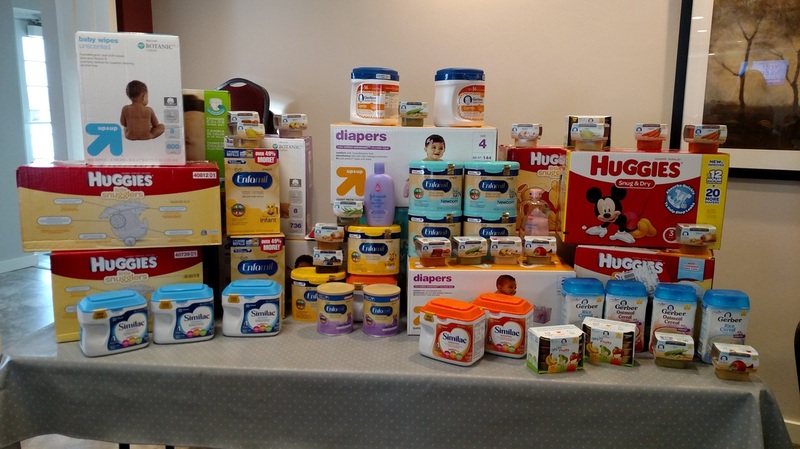 The Waupun Lions Club has donated $600.00 to REACH. 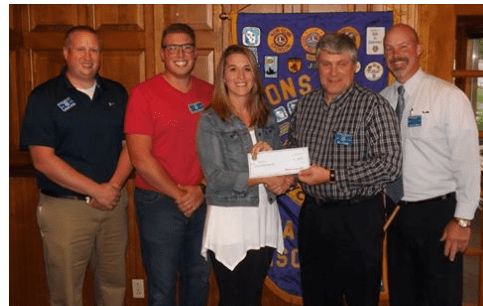 Shown presenting the check are Waupun Lions Jordan Sterk, Tyler Schulz, Kim Venhuizen (REACH), Waupun Lions President Bill Thome and Waupun Lion Steve Schueler. 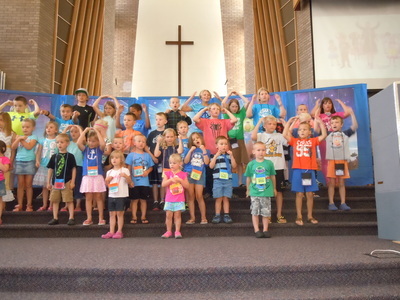 A huge thanks to SAGES Charter School for raising $309.62 for REACH for our summer splash month! 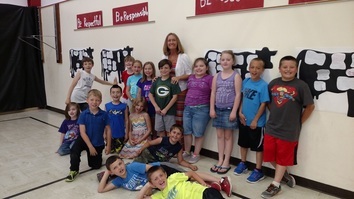 The 2nd grade class raised the most funds at $48.55! The 5th grade class came in at a close 2nd. Thank you SAGES students and staff for supporting REACH. Poverty Awareness for Community Education training was held on April 11th, 2016: talking about what poverty is and how it impacts the Waupun community. Thank you to Werner Harmsen Event Center for hosting and for the UW-Extension for leading our discussion! 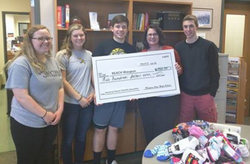 National Honor Society officers present REACH Waupun (Kathy Schlieve) with collected socks/underwear and a $500 donation! Thank you to all who donated. A huge thanks to SAGES Charter School for raising $1,200 for REACH through their "Change 4 Change" war. The middle school students raised the most and won a pizza party from the SAGES PTO. Great job by all students at SAGES. REACH thanks you for your support. 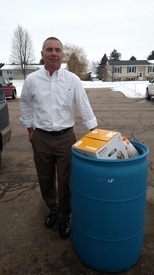 A tremendous thank you to Andy Vande Zande and his family for donation $700+ items for the January Donation Drive. "We want to do more than just write out a check. 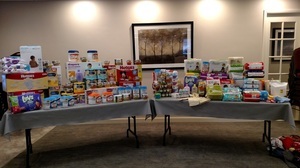 We are very blessed and wanted to give back locally." 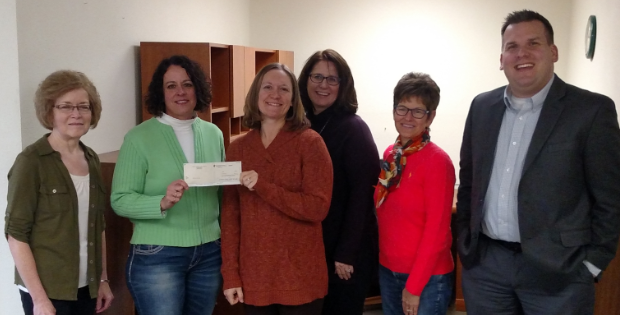 A huge thanks goes out to Union Congregational Church for their donation of $1,000 to REACH Waupun from the proceeds of their Cookie Walk in December! Thank you to everyone for coming out to the "PINK OUT AT THE RINK" and Waupun Hockey Team! It was wonderful to see so many people there to support this fundraiser for the Huizenga's, Agnesian Breast Cancer Foundation and the REACH Program. A great win and and awesome community event! 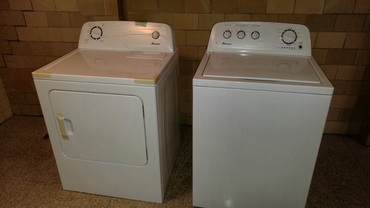 A brand new Washer and Dryer was donated to REACH to be kept at The Union Youth Center by Leonard and Trudy Frens to assist students and families with laundry needs. Meadow View Primary School First Graders collected items that will be donated to Mission Backpack in lieu of giving gifts this Holiday season! 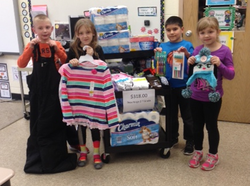 Rock River Intermediate School 2nd Graders ​collected items to be donated to the Waupun Food Pantry. ​The classes collected $318.00, clothing, personal care items, and food that will be provided to students/families in the community. 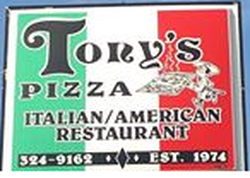 A huge Thanks to Tony's Pizza: 420 Fond du Lac St in Waupun for the recent donation of $1,000 to REACH Waupun! 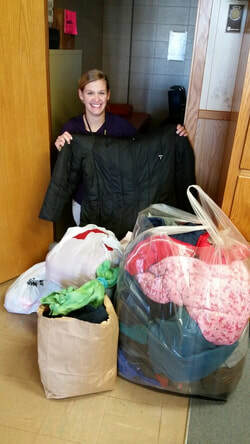 A huge thanks to the First Christian Reformed Church in Waupun for the donation of coats, snow pants and winter gear! Thank you to the Kickin' for Kevin, Inc organization. Through their generous efforts, they raised just short of $18,000 during their 4th annual event. We are thrilled to be selected as one of the recipients this year. REACH Waupun received a check this evening for $4,450 which will make a huge difference in our ability to fulfill our mission. To the DeBoer family, know that Kevin's legacy will live on in helping to build a community where neighbors help neighbors to REACH their full potential. Words cannot express our gratitude. 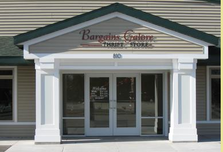 Bargain's Galore choose REACH Waupun as the recipient of their 9th Annual Community Benefit Day. Their donation to REACH was $1,000. THANK YOU Rebecca Hoffmann and the Junior and Senior High Choirs! They dedicated the choral concert on October 26, 2015, to REACH. Students in Mrs. Hoffman's classes were involved in service projects leading up to this concert. Listen to this beautiful reflection on what they learned through this experience. They all get an A in our book! We couldn't have summarized the importance of their actions better than this. They also conducted a penny war and donated $113.08 to REACH! Simply AMAZING! A big Thanks to St. Joseph's Church (Jean Burke) for the donation of children's socks and underwear! What is the Tough Warrior? 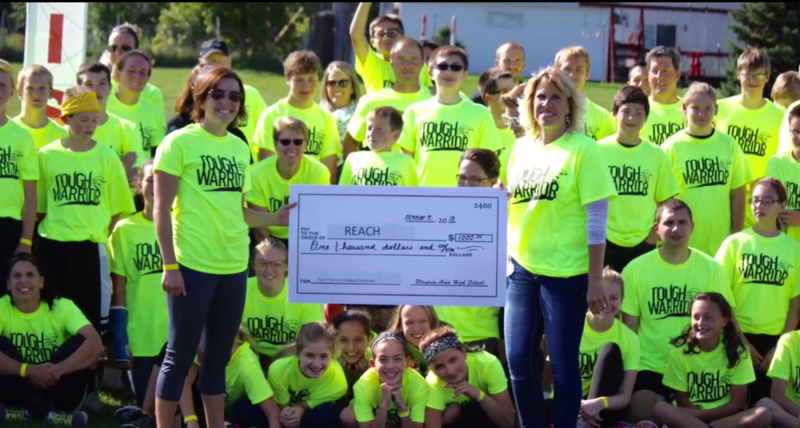 The Tough Warrior is a school wide event in which students help raise funds for our school & REACH Waupun (A community organization). On October 7th, we will have an obstacle course set up for students to run through. There will also be music, prizes, and other activities for students to participate in. We have a goal of raising $10,000. An effort that will only be achieved through everyone’s help! Click here to see the Tough Warrior video. ​Tough Warrior Raised $1,000 to be donated to REACH. Thank you Waupun Junior/Senior High School. 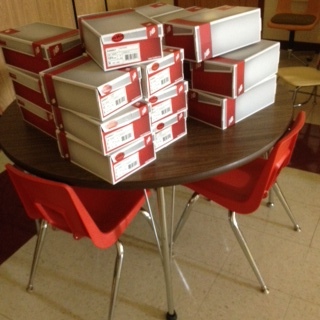 New shoes purchased for students! By these generous donations, 25 pairs of new shoes were purchased from Brooks Shoes in Waupun and were distributed to children in need in September 2015.